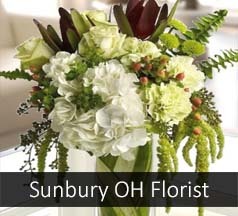 "Sunny Sunbury" is the name of the fresh flower arrangement chosen for the city of Sunbury by Flowerama's design team. Flowerama offers same day flower delivery and same day express flower delivery to Sunbury seven days a week. With four retail flower shop locations in the area Flowerama is the first florist to think of when sending flowers to Sunbury. Flowerama is an award winning flower shop and is family owned and operated. Doing business since 1990 Flowerama and Sunbury are perfect for each other. We also provide daily flower delivery to Sunbury businesses, and Sunbury nursing homes. Delivery to Sunbury is $14.95.